Once again, the nation’s plans for celebrating Martin Luther King, Jr. Day tend toward the anodyne volunteerism projects that have been the bread and butter of past and present White Houses since the advent of the holiday in 1983. Such fare has always evinced a terrible myopia about the meaning and memory of Dr. King. This year, in the wake of a litany of race-related issues including police killings of unarmed black men in New York and Missouri, vigilante killings of black teens in Florida, retrenchment in key elements of the nation’s civil rights history regarding voting rights for persons of color, and increasing gaps between whites and blacks across a number of issues such as wages, health, and education, the “volunteer day” approach to celebrating Martin Luther King, Jr. Day sells Dr. King and the nation’s racial troubles tragically short. The suggested MLK Day projects are all worthwhile, but they could have been attached to the name of any nationally respected figure who believed in and supported voluntary action, not just Dr. King: community disaster planning, organizing clothing drives, supporting food banks, teaching financial literacy, promoting the Earned Income Tax Credit, reading with children, organizing a book drive, STEM mentoring, planting trees in neighborhoods, supporting community gardens, organizing fitness events and walking teams, and supporting veterans. All good, all worthwhile, but nothing that reads like specifically addressing racial crises that have come to public consciousness (though they were there all along for African Americans) during the past year. This year, it might be more appropriate to address the questions of race that in their life-and-death seriousness have made a lie of the pipedream that the nation has crossed a historic divide and become a “post-racial society.” The election of a black president did not make the issue of race a remnant of the 1960s civil rights era. As the New York Times noted last month, the president himself is conflicted—and being tested—about what do and how hard to push regarding the changes he knows are needed in the way the nation treats people of color. This year, a different kind of MLK Day commemoration is needed. At Bates College in Lewiston, Maine, faculty and students will learn about and debate the meaning of MLK Day in light of events in Ferguson (the Michael Brown killing), Staten Island (the Eric Garner killing), and around the world, including issues regarding the treatment of Palestinians. 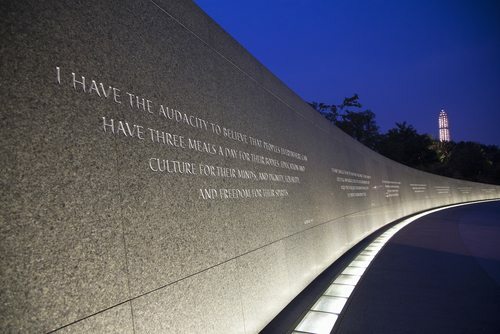 In Baltimore, the Reginald F. Lewis Museum of Maryland African American History & Culture will hold workshops on the civil rights movement’s meaning and legacy for today, including a capstone event including city officials, university faculty, and youth organizers on how to continue the organizing work sparked by the protests in Ferguson. Several days of programs and events on voting rights, poverty, segregation, and immigration will be held at Vanderbilt University, with such participants as Harry Belafonte (on voting rights), Andrew Young, and our personal friend Andy Imparato of the Association of University Centers on Disabilities (on the civil rights of persons with disabilities). Just last week, the news came down that the number-three ranking Republican in the House of Representatives, Majority Whip Steve Scalise (R-LA), gave a speech to the European-American Unity and Rights Organization founded by former Ku Klux Klan grand wizard David Duke. Scalise claimed not to know that this was a white supremacist organization despite its obvious name and Duke patronage (both Scalise and Duke are Louisianans). When the nation gives racism a pass, as with Scalise’s EURO speech, it is crystal clear that the U.S. is far from post-racial.